The headlights and instruments are mounted on a black cast aluminium stem. 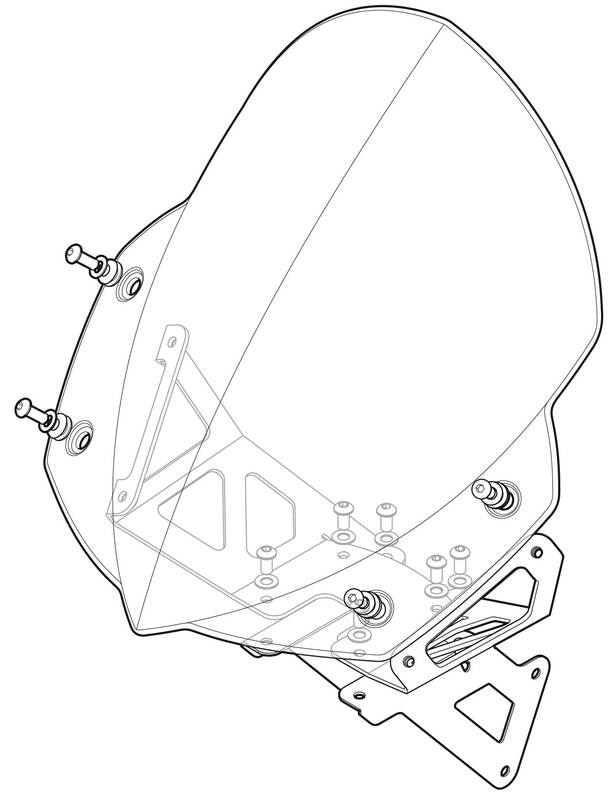 At the front of this stem, the headlights, you will find a plastic grille held in position by a single Torx T30 screw. Remove it, and the grille. This will give you access to the stem mounting bolts. IMPORTANT: plug the hole in the stem with paper towel or a rag. This is to stop the nuts from falling into the frame as you remove the bolts. Now, using a 10mm ring spanner to hold the nut, unfasten and remove both stem mounting bolts on the right hand side. Fit one of the small ‘L’ brackets. The flanges on these should face inwards, towards each other when mounted. Now refit the bolts and nuts. Fitting the upper one somewhat fiddly. Our technique is to fit the lower bolt and nut first, then hold the other nut in the ring spanner, look through the bolt hole to line it up, and then insert the bolt. Repeat the operation for the left side, remembering to fit the cable tidy on the outside of the bracket. Tighten the mounting bolts fully and refit the plastic grille. Now fit the main bracket: carefully place it in position, and loosely fit the six 12mm hexagon head screws with their washers. Once all screws are in, tighten them evenly. Now fit the screen, using the four special screws. These screws have shoulders to avoid compressing the grommets too much – don’t try and overtighten them or you may damage the threads.